The GB74Gig features Humbucker, J-style single-coil and P-style split-coil pickups, ensuring players can deliver everything from unbridled power to a buttery smooth tone. The unique bridge pickup is capable of punching out meaty humbucker sounds as well as clear and open single-coil tones, with a 3-way toggle that enables the player to choose between coil or both. The pickup balancer knob provides further versatility, so you can select or mix in the split-coil P-style neck pickup. Controls also include an Omega Bass bridge and Passive Tone control. The GB74Gig is finished in Lake Placid Blue. The B4 Plus AS line-up has been updated to include an RM variation. RM models feature a Roasted Maple fingerboard which lends itself to a brighter and punchier sound. The guitar also boasts an open pore finish body, which is available in three new finishes – Aqua Blue, Burgundy Red and Trans Black. Five-string versions are also available. Cort’s Action Series has grown to include the new Action HH4, replete with a two-humbucker configuration and a versatile wiring scheme which opens players up to a variety of usable sounds as well as the usual active/passive switching option. The tone control has also been wired to be usable in the passive setting for even more tonal variety. There are three finish options - Blood Red Metallic, Tasman Light Blue and Black - all with a pearlescent effect to help bassists cut a dash on stage. 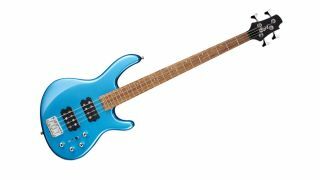 Find out more about Cort basses.